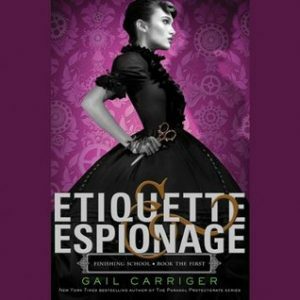 I borrowed an audio copy of Etiquette & Espionage, by Gail Carrier, from my local library. Carriger just never fails to amuse me. This is a more MG/YA delivery than the Parasol Protectorate series, which is one of my favorites. But I still laughed out loud more than once and loved seeing early appearances of some later familiar characters. In the end, I passed it to my daughter, sure she’ll love it too. Quirk does a marvelous job with the narrations. This entry was posted in books/book review on November 26, 2018 by Sadie.